During the 19th century Rotterdam expanded rapidly with cheap housing built to accommodate the influx of labourers migrating to the city. Originally these were mainly unhygienic back-to-back houses built by private developers. 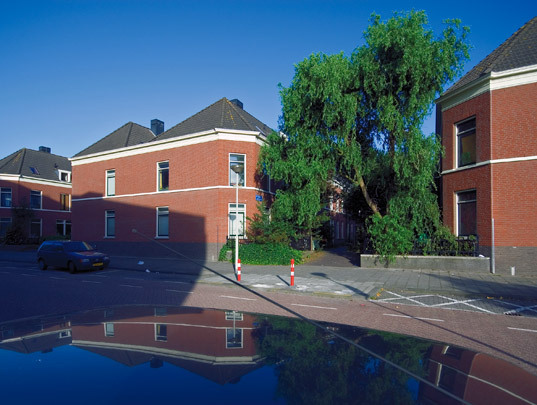 In 1895, 96 detached pairs of tenements (one unit per floor) were built here in Feijenoord for a local workers' housing association. Each tenement was 5.5 metres wide and 8 metres deep and cost less than a euro a week to rent. Most of Rotterdam's back-to-backs have been demolished. These examples have since been broken open and upgraded, yet their site layout still recalls this black page in the history of Dutch social housing.